True Point Audio Ltd offers a service second to none that can bring your Pink Triangle turntable back to a better than as new condition. If you feel your turntable is not performing as good as it did, then send it to us where we will give you a free evaluation of what is necessary to bring it back to pristine condition. It won't just look good it will sound much better as well, and it will increase its value. Sapphire bearing assembly checked and the sapphire replaced if necessary, this also includes replacing the tungsten carbide ball. Drilling and threading the brass spigot for an M3 thread so that a record clamp may be fitted if required. Turntable motor checked for noise and speed stability. New springs and rubbers fitted to the sub-chassis suspension. Steel screws replaced with stainless steel ones. New lightweight armboard drilled and fitted for customers tonearm. 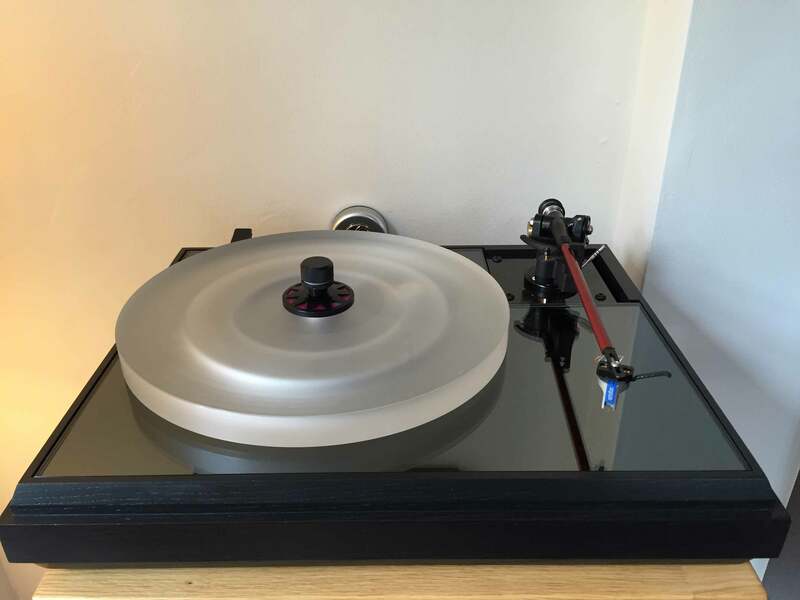 Balance weights selected by mass and fitted under the armboard to achieve the correct balance of the sub-chassis with the customers tonearm, so achieving a more easily levelled sub-chassis. Control unit checked and all electrolytic capacitors replaced. Other components will be replaced if it is deemed necessary in order to make the Speed Control Unit accurately control the platter speed. New power supply cables fitted. Pink acrylic lid polished to remove surface scratches. Sorbothane hemisphere feet fitted to the underside of the turntable. Wooden plinth restored as required. Painted metal surfaces rubbed down and repainted. Special modifications undertaken to customers requirements. From Andy in Woking, Surrey, re. his PT Export. "What can I say...apart from a massive thank you!! I set it all up this morning, followed the instructions (which is unlike me!!) and put on "She's not there" by Santana.. Absolutely incredible! Sound is perfect, looks amazing.. Thanks again! From start to finish, your service has been first class"! From Finn in Denmark, re. his PT Anniversary. "The turntable is well received and I think it will be up and running at the end of this week, I will take some photos and send to you. Up to now I am very impressed of what I have seen, it looks very nice, way better then expected. Thank you for a very good service. Regarding your service I will tell all the guys in Denmark that I now having an old Pink"! From Andrew, West Bromwich, re. his PT1 motor.